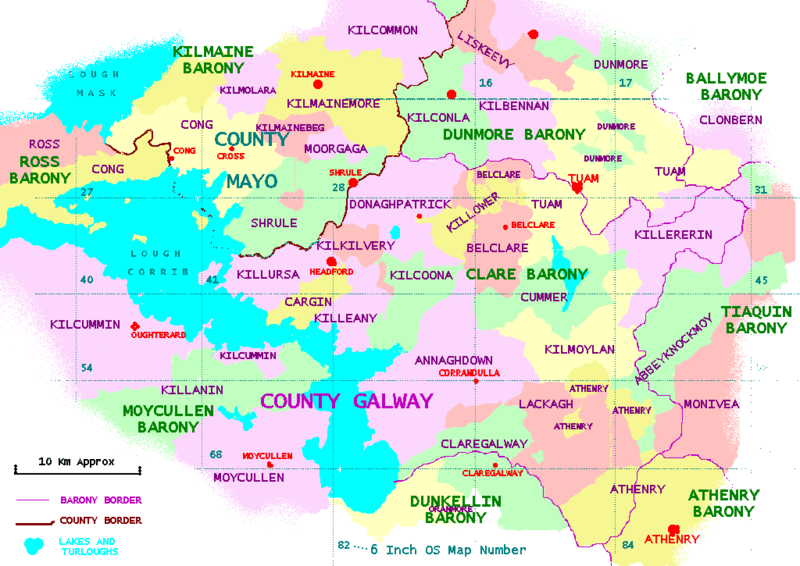 All of Killursa , Cargin , Killeany , Kilkilvery , Kilcoona , Donaghpatrick ,Belclare , Killower , Cummer , Annaghdown ,Kilmoylan and Lackagh – Part of Athenry , Abbeyknockmoy , Killererin and Tuam . The original Ordnance survey 6 inch sheet numbers are included for reference. (Green number in top left of each grid square). I so enjoyed the post of 6/2/10 Our Irish Family History Tour . I am plnaning a trip to County Leitrim in the summer of 2012 to accomplish the same. Our Sweeneys, too, were from County Leitrim and seem to have left Ireland 1847-1850. Likely they were from Rossinver. The oldest ancestor I can trace to US was Hugh Sweeney born in 1790 s and married Hannah McGovern also of Rossinver. Their children were born in the 1830 s: Peter, Kate and John. Not sure of others. Peter married Teresa (Tressie) Casserly of Roscommon prior to arriving in the US with their 2 yr old son Edward. Tressie was 1 of 14 children. The Sweeneys seem to have arrived in the NY port then stayed in Platteville and within a few years settled in Whitewater, WI. There is also an Ann (Sweeney) McGee, born in 1790 s, who married Patrick, also of Rossinver. They came to US in 1847 with their grown children and stayed in Newburgh, NY for a few years then on to Whitewater, WI where several Sweeneys are buried. Unsure of Ann McGee’s relationship to Hugh Sweeney. Hope to hear back. Am anticipating I encounter the same wonderful visit to Ireland.